I have a secret. Even though I signed up for the race the day before, even though I have only been allowed to do cardio for three weeks following a forced six-week hiatus after wrist surgery, even though I promised myself I wouldn’t care about my pace until six weeks after my first run back, I had a goal time for the Silver Spring Earth Day 5K on Sunday in the back of my mind. I wasn’t trying to beat my time from last year’s race. A 23:46 — an average of 7:38-minute miles — is a good 5K time for me, and that would’ve been setting myself up for disappointment. However, I thought I could come in under 25 minutes, even in a worst-case scenario. My legs had other plans. The last mile, a long uphill on Wayne Avenue, was simply rougher than I expected, and I ended up finishing in 25:18—roughly 8-minute miles. As in, my normal training pace for five- or six-mile routes just a couple months ago. Ugh. 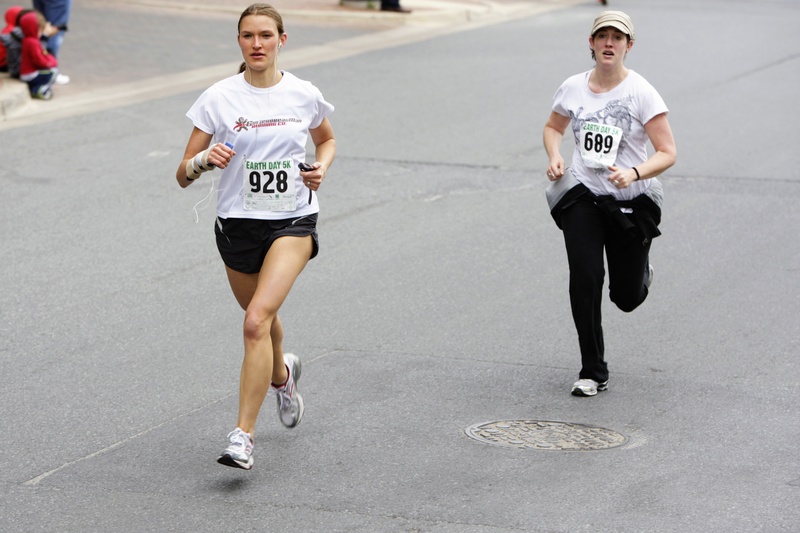 Last year, I looked comfortable and strong in my Earth Day 5K race photos. This year, I looked less like a woman running a race and more like an exhausted invalid on a very serious, grim mission to deliver an iPod and a Garmin to someone across the finish line. I spent a minute or two sitting on the curb, pouting and feeling bummed that I now had a solid, depressing metric to compare the shape I’m in now to the shape I was in a year ago. But I realized pretty quickly that I’d chosen the wrong metrics to define victory. True, I was slower than last year. But I’d discounted the fact that the ability to run at all, in a race or otherwise, represented a massive improvement over two months ago, when I was laying on the couch in a Percocet daze, unable to make it through the afternoon without a nap. I picked myself up off the curb and caught up with my running buddies. We headed to brunch at a greasy-spoon diner, where, as one running buddy put it, we all set personal PRs for caffeine consumption in a single hour (that coffee was heavenly!). And after brunch, when I put on my fleece for the jog back home, I accomplished what is a huge victory these days: I zipped up my fleece without outside assistance! My running buddies, appreciating my own personal victory even more than I did, cheered as if I’d just broken the tape at the Boston Marathon. In other news: I can type with both hands again! I have to take regular breaks to avoid swelling, so my blog posts will likely continue to be sporadic for at least a few more weeks. Better yet, I finally get to start formal physical therapy tomorrow, making me feel like more victories are in my near future. I think it’s super brave of you to have done the race at all! I’d have just assumed I was like 10 minutes slower and pouted well before the starting line : ) And seriously, you’re still speedy in my book–I hope you know how motivating you are! Good luck in physical therapy and congrats! I’m with Purple shoes – I’m so impressed that you even raced! 25 min ‘n change is a great 5K by most standards 😉 I think this is awesome! WELCOME BACK to racing!! I am so excited to hear this. And you are phenomenal. Way to be tough and not let your ego get the best of you.